On Friday we made our first direct investment in a utility-scale renewable energy project — two wind farms that generate 169.5 megawatts of power, enough to power more than 55,000 homes. These wind farms, developed by NextEra Energy Resources, harness power from one of the world’s richest wind resources in the North Dakota plains and use existing transmission capacity to deliver clean energy to the region, reducing the use of fossil fuels. Through this $38.8 million investment, we’re aiming to accelerate the deployment of renewable energy — in a way that makes good business sense, too. To reach a clean energy future, we need three things: effective policy, innovative technology and smart capital. Through our philanthropic arm Google.org, we’ve been pushing for energy policies that strengthen the innovation pipeline, and we’ve been dedicating resources to developing new technologies, including making investments in early-stage renewable energy companies such as eSolar and AltaRock. Smart capital includes not only these early-stage company investments, but also dedicated funding for utility-scale projects. To tackle this need, we’ve been looking at investments in renewable energy projects, like the one we just signed, that can accelerate the deployment of the latest clean energy technology while providing attractive returns to Google and more capital for developers to build additional projects. We’re excited about this first project investment because it uses some of the latest wind turbine technology and control systems to provide one of the lowest-cost sources of renewable energy to the local grid. The turbines can continuously adjust the individual blade pitch angles to achieve optimal efficiency and use larger blades with 15 percent more swept area than earlier generations, allowing capture of even more wind energy for each turbine. 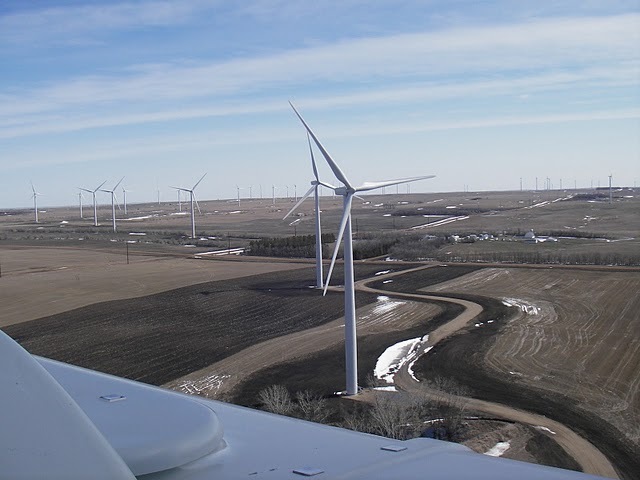 The control systems for these wind farms are also advanced and dynamic, allowing for remote 24/7 monitoring and operation to ensure maximum turbine up-time and power production. A couple of us got a chance to climb 80 meters up one of the 113 turbines to see firsthand how the rotating blade motion goes through a gearbox to turn the generator that makes the electricity. The climb to the top also provided a great view of the entire wind farm (don’t worry — we all had harnesses and turned the turbine off!). We look forward to finding more opportunities to invest in renewable energy projects that use the latest technologies to push the envelope for delivering low cost clean energy. We’ll let you know what we find.